Johan Kristoffersson is statistically the most successful World Rallycross driver in history. Known as much for his precision and smoothness as his 100% dedication and devastating one-lap pace, the two-time champion is at the top of his game. People's perception of rallycross is changing as a result. Once it was seen as a gaggle of cars constantly sideways, careering between dirt and asphalt. Furious sideways action and panel-bashing remain but, more than ever, technique, tactics and driving styles are evolving. One reason for this is that rallycross is in a stage of development whereby circuit drivers are more prepared than ever to take it to the rally drivers and win. This is perhaps why Kristoffersson has been so successful. The son of rallycross and touring car racer Tommy Kristoffersson, the Swede only started racing at the age of 20 after turning his back on a career in cross-country skiing. 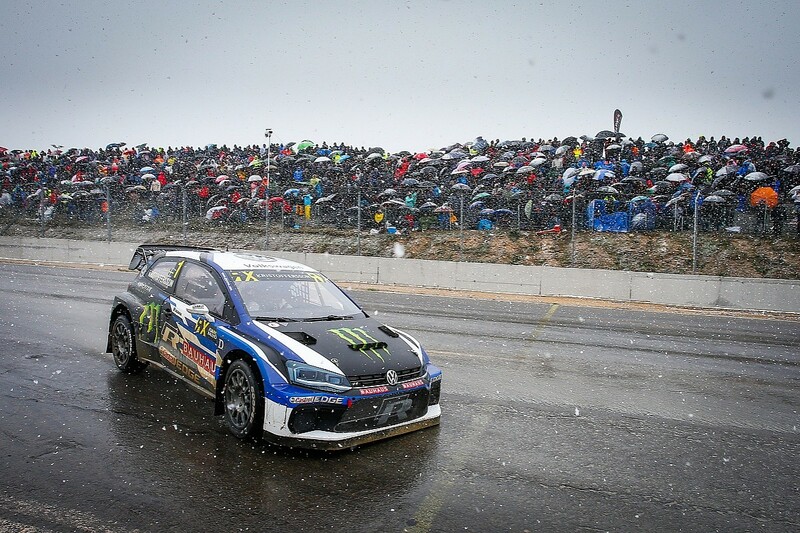 Since then he has combined rallycross and circuit racing, winning the Scandinavian Touring Car Championship in 2012 and the World RX title last year. This year he's swept the board in both. Methodical and blindingly quick, Kristoffersson is the benchmark for the future of rallycross. His success has prompted an interesting question: do circuit racers now hold the advantage in the world of rallycross? Since gaining world championship status in 2014, rallycross has undergone something of a revolution. The category that used to be seen as a niche, suitable only for those with experience on loose surfaces, is now being dominated by circuit racers. Kristoffersson and fellow touring car ace Mattias Ekstrom have shared the past three titles between them, Kristoffersson dominating this season with an unprecedented nine wins from 10 so far. That's not to say that the chances of a 'traditional' rallycross driver ever winning the championship again are gone, just that they'll have to adapt to a changing landscape that's beginning to favour those with a circuit-racing background. Despite strong rallycross roots, Timmy Hansen spent his early racing days climbing the single-seater ladder, and was a race winner in Formula BMW. Faced with no other options when budget issues curtailed his Formula Renault Eurocup campaign in 2012, Hansen gave rallycross a crack with his 14-time European champion father Kenneth's team. "I wanted to drive something and it didn't matter what it was," Hansen Jr explains. "I was really down when I gave up my F1 dream. So I spoke with my dad and he gave me a go in the rallycross car. The key to getting to where I am now is my dad, he really saved my career." As a rallycross rookie, Hansen admits that he had to learn the trade the hard way, in competition. But far from trying to become an out-and-out rallycross driver, he decided to take his circuit-racing style and adapt it to his new environment instead. "I knew nothing about driving sideways or using the handbrake. I was used to looking for marginal gains and focusing on minute details from circuit racing," he says. "When I made the switch, I just drove my normal style and developed the weaker areas." Hansen just loves driving. And for him, rallycross is the ultimate challenge that extracts everything from his skillset. "It took some time for me to get used to sliding and using the handbrake," he says, "but I'm able to combine the precision in finding the right braking points and hitting the apex from a single-seater with the movement and sliding of a rally car." 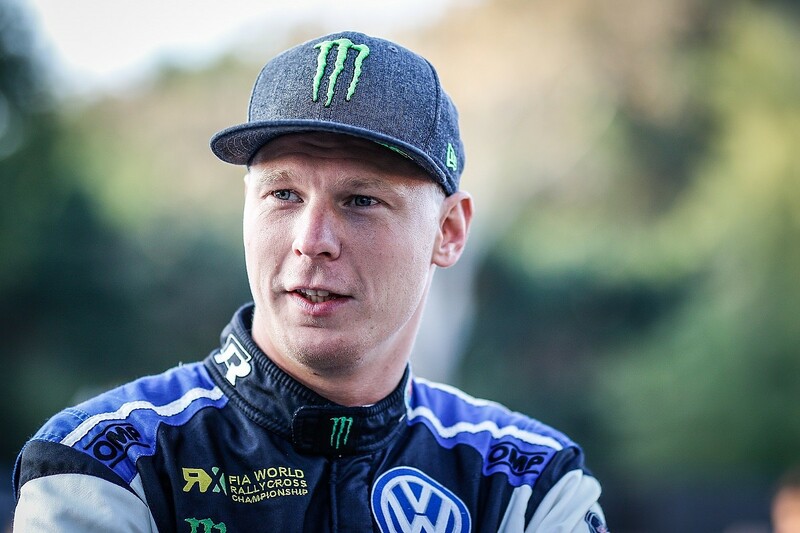 Kristoffersson concurs: "You can definitely combine circuit racing and rallycross to become a more perfected driver. For circuit racers, you have the experience of learning a new track and getting the maximum out of the car every time. "For rally drivers, you can adapt to the changing conditions more and alter your driving style to suit these conditions. You are more comfortable with sliding and looking for extra grip on the loose." Technique and raw skill are essential components of rallycross. Reacting to differing grip levels in a variety of weather conditions, combined with the awareness required to race tactically, is the key to success. Ekstrom, who was champion in 2016, is another driver with rallycross in his blood, his father Bengt having raced competitively when Mattias was a child. A late bloomer in RX, the double DTM champion - and three-time Race of Champions winner to boot - shares the views of Kristoffersson and Hansen. "About 10 years ago, you would be better coming from a rallying background," the Audi man explains. "There were more real gravel sections on the tracks, but these are becoming less common these days. "Tyre management and driving within the grip limit available is now more important than ever. I guess drivers who have had side by-side racing have an advantage in rallycross as they have had more experience of this than the rally drivers." There is evidence to suggest that rallycross tracks are moving towards less surface-grip variation, favouring drivers with a circuit- racing background. Ekstrom reckons that "traditional" RX tracks are now a thing of the past and the emergence of increased tyre management is a key part of this shift. "The tracks have developed a lot more now," Ekstrom says. "But in my view, they have developed in the wrong way. The gravel sections are more or less concrete now and actually, some gravel sections have more grip than the asphalt." It seems bizarre to think of gravel offering greater grip, but while some in the paddock lament the predictability of the surface, others feel that the consistency is no bad thing. World Rallycross commentator Andrew Coley says: "Of course there are tracks now that don't have proper loose gravel sections anymore. Portugal [Montalegre] and Loheac [in France] are good examples where it's pretty solid. "Riga, for example, has a really abrasive surface and a smooth gravel section. It definitely gives more consistent grip levels, but I think that's what the fans want. They don't want car-breaking surfaces and titles to be decided on mechanical failures. Consistency adds to the show and makes the championship more exciting." While rallycross is in essence anything but predictable, such is the nature of the short, sharp bursts of action and the juggling of the order resulting from the joker lap, the evolution of circuits has forced traditional rally drivers to adapt to a style more akin to circuit racing. A style like Hansen's, with precision honed in single-seaters, was no better demonstrated than in his semi-final win in Hell earlier this season. "It definitely pays off to be clean in rallycross, to look after your tyres, even though the races are so short," he says. "I still use the same style now. For example, in the semi-final in Hell, I tried so hard to preserve my tyres for the final. I ended up braking in a straight line, turning in smoothly, straightening the steering and feathering the throttle on acceleration. "On that track especially, you learn when to push, when not to. It definitely helps on certain tracks to drive sensibly." 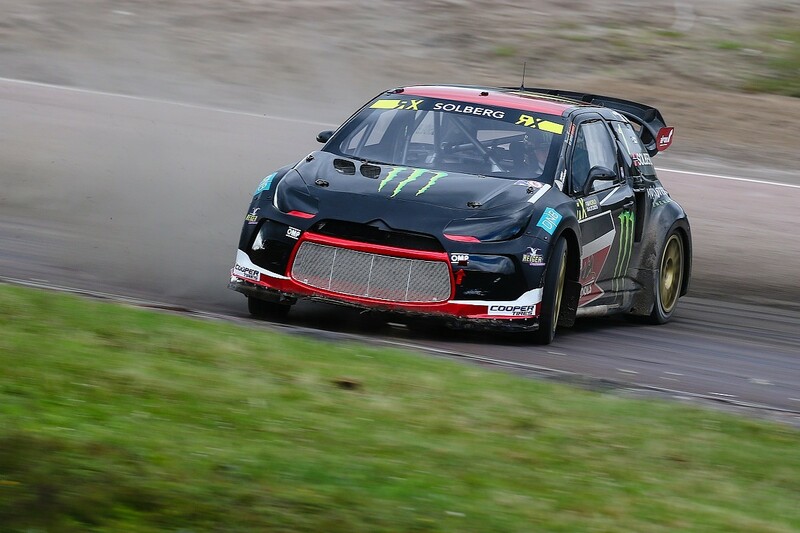 Having observed Hansen since the start of his rallycross career in 2013, Coley agrees that this approach is paying off. "The advantage the circuit racers have, almost above racecraft, is their ability to hit the same apex at the same speed every time. Rally drivers are just as quick as the circuit racers over one lap, and probably better at dealing with the joker, but they aren't as precise over the rest. "That's why Johan has been so good for the past two seasons. He never forgets a thing, and he's tactically very good. Rallycross is all about building the weekend and Johan has been able to dig himself out of some big holes because he's so precise on every detail." Is there such a thing as 'rallycross technique?' Not if you ask Ekstrom's EKS team-mate Andreas Bakkerud, who is rallycross through-and-through. The Norwegian did a bit of go-karting in his youth before dabbling in the hugely popular - and very Scandinavian - Bilcross, the budget version of rallycross, which gave him a grounding in the necessary skills to make it as a professional. Bakkerud believes technique is not so much learned as acquired instinctively. 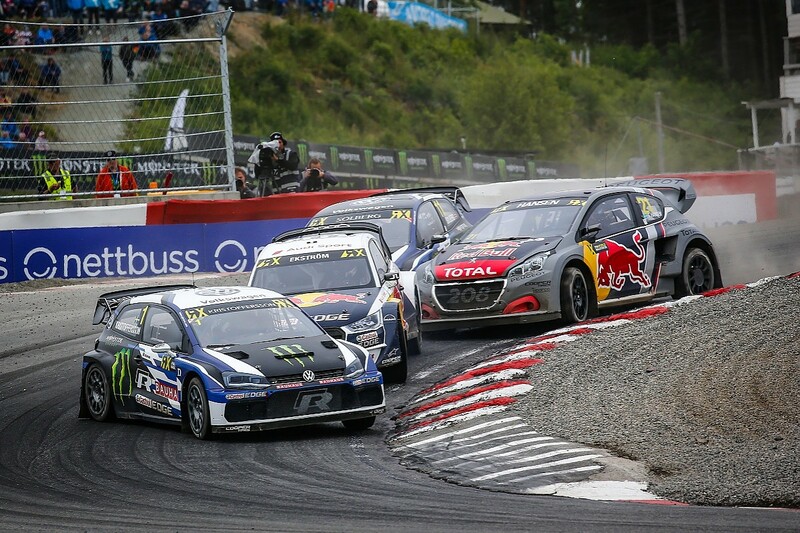 "Rallycross is motorsport's answer to MMA!" he says. "It has everything: jumps, gravel, racing. It combines every aspect of racing with the craziest cars. "I grew up watching rallycross on TV in Norway, watching Martin Schanche fighting with guys like Kenneth Hansen, Will Gollop. In the 1980s and '90s it was very big. "Bilcross is a great way to learn. You build your own car, race it and learn the workings of the car. It also teaches you how to drive with damage!" 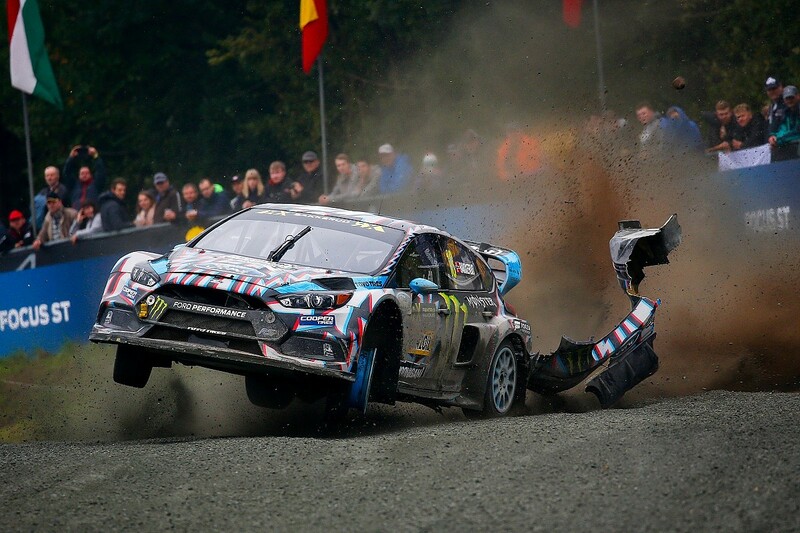 A quick search on YouTube provides proof that Bakkerud is one of the best at dealing with a damaged car - he famously won a heat with broken rear suspension at the Estering, one of few classic rallycross tracks remaining on the world championship stage. He insists that being quick in modern WRX beasts is more about who makes the fewest mistakes than any specific technique. "These cars are very easy to overdrive," he says. 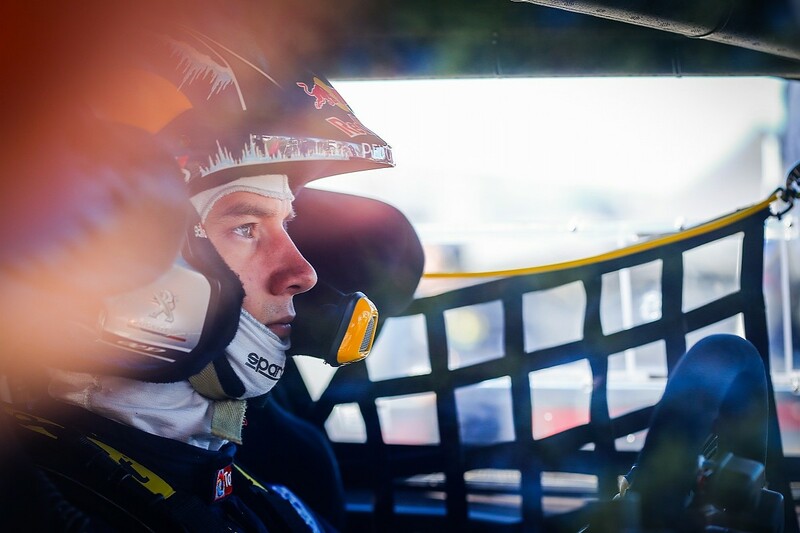 "The rear gets loose on the gravel and you also have to be precise on the Tarmac. "Everyone overdrives in rallycross, it's just that the guys at the front overdrive less than those at the rear. "You do need to look after the tyres on the Tarmac sections so you have to alter your driving. You can't always go sideways, 'Solberg style', you have to be clean as well." But Kristoffersson adds: "WRX cars invite you to push the limits, and sometimes you are forced to go way over the limit to get the most out of it." The truth is that traditional 'Solberg style' is beginning to fade away, at least on tracks where degradation on the control Cooper tyre is higher. 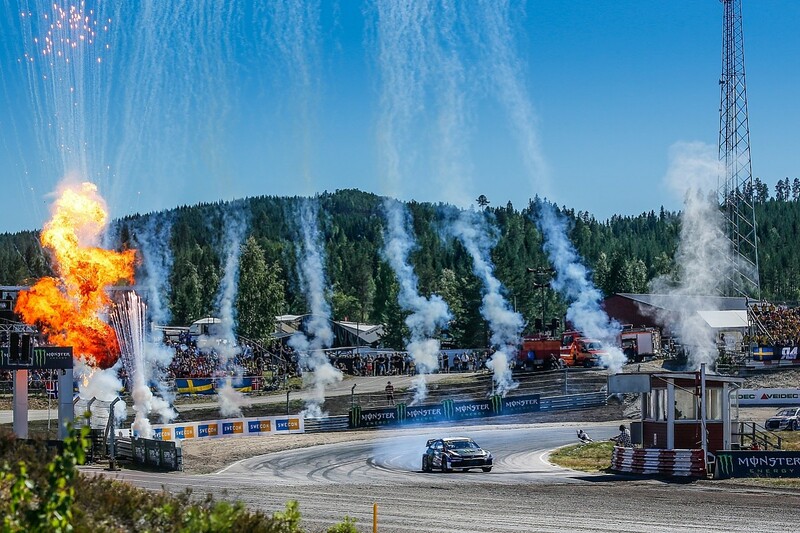 But 'old school' tracks like the Estering, Holjes and Loheac, which retain a classical gravel/asphalt split, permit rally drivers to thrive and still allow for audacious moves of the kind that rallycross is so famous for. Ekstrom is a fan of the traditional tracks, but also offers an insight into just how much the tyres alter his own driving technique. "The tyres we use, longitudinally they have very good grip, so acceleration and braking is very effective and you can use all the rubber," he says. "Laterally they are not so good, so it puts you off sliding the car because you will lose grip and time. With these tyres, it's better for your lap time to drive smoothly." That's why 'Solberg style' - typified by 2003 World Rally champion turned RX star Petter - may be on the way out on asphalt. But, as Coley explains, there is still an area of rallycross where it's better to be lairy. "Rally drivers, or drivers with a lot of experience on the loose, tend to fare better in the joker lap than circuit racers," he says. "They're more used to changing grip levels and surfaces and can adapt, especially in changeable weather, to almost anything. Circuit drivers are more used to the consistency of grip, so I think they struggle a lot more. "Guys like Petter, I always say are more likely to find time in the joker with a more sideways approach. They look out of control but they always find the apex somehow. It's also why Johan has gone to Petter for advice on how to drive the jokers better - there's a lot to gain there." Drivers therefore have to be more calculated in their technique, knowing when to deploy 'Solberg style' and when to look after the tyres. The balance is not always as obvious as it seems. For the past year and a half Kristoffersson has been the benchmark, not only for what he has achieved, but also for what he does away from rallycross. Until Ekstrom hung up his DTM boots for good at Hockenheim earlier this season, Kristoffersson was one of only two full-time RX drivers to combine his regular job with circuit racing, which is all the more remarkable given his late start in the sport. "I only really decided I wanted to do racing as a career when I was 20," says Kristoffersson. "My attitude was, if motorsport goes well, I quit skiing. If it doesn't, then I will try to become a professional in skiing. It doesn't matter what you do, as long as you give it 100% effort, you will succeed. "So I started very late compared to the other drivers I was racing against, but I think bringing the skiing mentality and approach to perfection and training helped me a lot when I started." Kristoffersson strives to become the ultimate racing driver, and his exploits in the STCC are all part of the training. Tyre management, straight-line braking and smooth acceleration - it all helps find those marginal gains. It's less of an art and more about calculated logic for Kristoffersson. He believes success comes with perfection and mixes circuit racing with rallycross in pursuit of that. "I think more drivers are trying different disciplines, which is a good thing. Ten years ago they used to say, 'This guy is only used to driving rear-wheel-drive cars or front-wheel-drive cars', whereas it's not really the case anymore." Kristoffersson switches from his 4WD VW Polo R in rallycross to the FWD Golf GTI TCR in the STCC with comparative ease, although the two cars are very different. He has to point his TCR machine at the apex deliberately, not be too eager on throttle application and not allow it to drift, otherwise it will understeer. Tyre preservation is at a premium and drop-off can be severe. Hansen says: "I think it is very important to drive a lot of different cars. What Fernando Alonso has done recently has been really impressive and I hope that encourages more drivers to do different things, not just stick to their series." With rallycross increasing its profile and expanding its horizons with its made-for-TV format, it's little wonder that it's becoming a draw for drivers from various disciplines. And while it seems that circuit racers are the pull-factor for many new fans, there is evidently still plenty room for the traditionalists to showcase the category's brilliance and take it further than ever before.